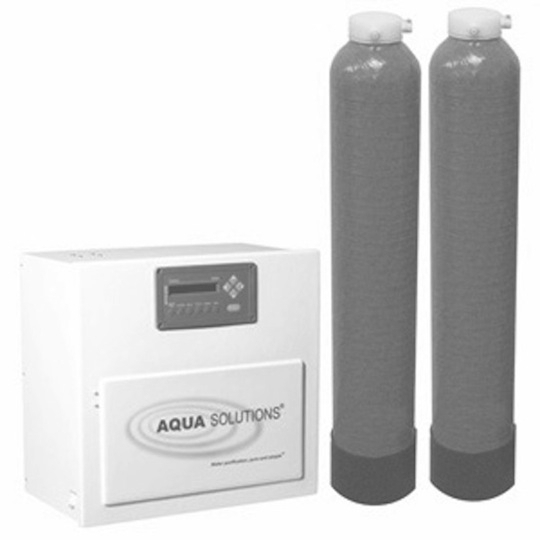 The AQUA SOLUTIONS' Model 2635S2-DW11 is also available in a Dual module version: Model 2635S2-DW. Ultimately, dual-module systems cost less to operate. It is also available with an RO tank: Model 2635S2-DW11-RO. The system includes one installed plus one spare 7" (178mm) diameter by 20" (508mm) tall DI tanks, an activated carbon prefilter assembly with a pressure regulator and gauge, a purity monitor light, and a 42-Liter pressurized DI storage tank. Ion Exchange Capacity is 12,000 Grains.